You know that jar of food at the back of the pantry that you find when you move house – and it’s 10 years past it’s use by date? Or maybe you’re not as disorganised as I am. But I bet you’d still like to be able to see everything in your cupboard, without needing a torch, right? 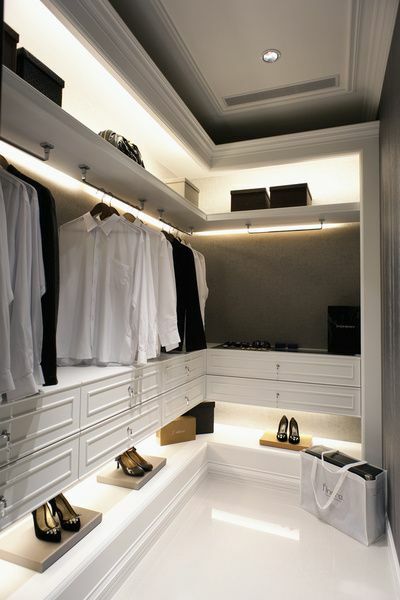 LED lighting has so many advantages when it comes to lighting inside cupboards and in joinery. It’s predecessors, halogen and fluorescent certainly put the light where you needed it, but halogen brought so much heat that it could turn food if left on in the pantry over night, and fluro needed so much space that you ended up with huge coves to hide it. With LED linear strip lighting, and small LED puks however, the heat created is minimal, and the size – well, that’s where it gets exciting. A puk can be as small as 20mm diameter and less than 10mm deep. That means, regardless of the timber you use for your joinery, you’ll be able to hide that little guy away easily. So now that we can put light everywhere where should we put it? Using light built into joinery to highlight features or bring sparkle is another excellent way to add WOW factor to a room. Used to light through glasses, or to highlight sculptural artworks, this built in illumination ensures your most important design elements are always a focal point. So whether your adding light for function, or to enhance and change the aesthetics of the room, remember to plan early and keep it simple. Oh, and don’t forget to figure out how you want to switch it - you can have the “fridge light” effect, a local switch or tie it into the overall lighting of your room. Important to know early as it changes everything when it comes to installation.